I had the opportunity to check out an incredible pop up this past weekend at Connector Cafe & Grill a local favorite cafe of mine. As you all know by now coffee is my go to for just about anything, not only does it give me a push to start my day off right but I really just love the flavors of coffee and always look for different kinds I can check out. Church St. Coffee Company specializes in cold brew coffee & nitro cold brew coffee – what is cold brew you may ask? Well it’s coffee that is never exposed to heat and the steeping process is a bit different than a normal hot brew. 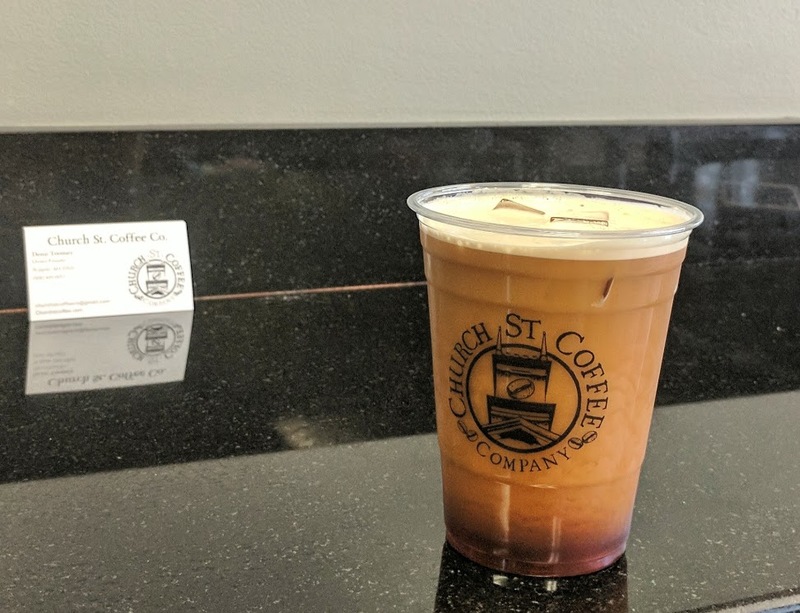 Denis Toomey, owner and founder of Church St. explained to me how it works, what they do with their own coffee, where it comes from and then of course I had several samples and had a full cup of their original brew. For a little history, Church St. started back in 2015 and was named after a street that Denis grew up on in Martha’s Vineyard. Because of his love for his native country of Costa Rica he wanted a connection between them and the coffee you drink right here in Massachusetts. With connections to the small “fincas” or farms they are able to create a sense of community and also produce some high quality cold brew. 100% Arabica Coffee in their cold brew. Locally roasted and all batches are handcrafted. Almost 70% less acidic than hot coffee and easier on the stomach. More caffeine than a hot cup (about 27 mgs of caffeine per fluid ounce). Cold brew is steeped in cold water for 24 hours and double filtered for a crisp and smooth finish. They were all delicious, and especially with the cinnamon and pumpkin (two of my fave flavors) there was just a hint of the flavors- not overpowering at all. The Chai is done already sweetened, it was delightful and creamy. As a wonderfully delightful sidenote I had a special breakfast while having my delcicious coffee. The weekend special was Captain Crunch French Toast w/Maple Glaze- it was as good as it sounds! Check out the photos and make sure to visit their respective websites to get all the information you want! Look at that Nitro Brew set up! Finished my visit off with some Nitro Brew Chai- delish!